So when someone decides to volunteer as a teacher for the underprivileged in order to make a significant difference to society it becomes all the more important to tell, explain, demonstrate, and inspire. Therefore, I would like to tell you about Step Up for India, a non-profit organization that enables skilled volunteers, but not trained as teachers, to teach English in government schools in Karnataka. English was introduced in Karnataka government schools in 2007, and the children begin learning the subject only from class I. I met the women behind this organization and this is their story. The founders approached the design of the program from a different angle and ended up with a novel technique. Two things were needed to make this idea work: a structured program in English, tailored for children studying in vernacular language government schools and a methodology that could be easily implemented by volunteers who were high on interest but short on time. At first, they looked around for material that had already been written by others, but nothing available was suitable for the volunteers, who are not trained teachers but are well educated with a limited amount of free time. So they decided to make their own material that would cater to their requirements. Since they had already been working in government schools, they were well-prepared to develop a program. They created textbooks for the students, and colourful posters and handbooks for the volunteers. Their aim was to ensure that whatever must be taught should be bite-sized, while keeping it fun for the students. 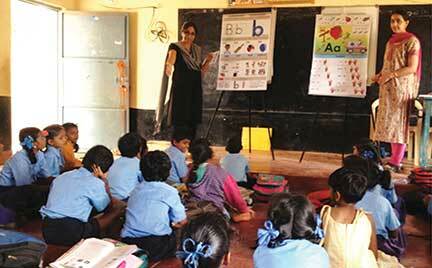 They wanted to instil a love for learning in the young minds. For the volunteers, the program has been structured in such a way that every volunteer in a team of six to ten needs to pledge only one hour of his/her time a week, for anywhere from 10 to 20 weeks in a year. The volunteers teach in teams of two, and the teaching material has been designed in such a way that any pair of volunteers can pick up from where the other volunteers stopped. Under normal circumstances the text books are created for the kids. Here one set of books are created for the kids and a corresponding one for the volunteers (the book which describes how to teach in a clear and precise manner). Because these books go hand in hand, “any pair of volunteers can pick up from where another pair stopped.” This was specifically done to address the fact that each volunteer has very limited time to spare. There is also a workshop for volunteers during which they’re shown how to use the prepared material. Classroom management is integrated into games and activities, as volunteers may find it difficult to control the large number of students. This plug-in plug-out system of teaching is one of the reasons they attribute their success to. According to Shanthi Nair (another founding member), the three things which make the program work are: the program structure, the modularity and the fact that everyone – volunteers and students – always has a great time! The team wants the program to reach all the children that need it. Since it is not necessary for a volunteer to know the native tongue of the children, the same concept can be spread to other regions with ease. Whatever support volunteers need to explain a certain concept to the children is provided in the volunteer handbooks where many useful words are transliterated into the English script. For example, hesaru (the Kannada word for “name”) is written in English script. So it is easy for volunteers to speak common words and sentences in Kannada, which makes it easier to teach their students. As the group works hard at educating the current students, they are also looking towards the future. Sangna Lakshmi (the third founding member) says that, in addition to expanding to further cities, they wish to expand the program to other subjects as well. Their first batch of students will soon complete the two-year English course, which is taught as a regular course in school. Many of the volunteers are engineers, and are keen to teach maths. The plan is to teach Math in English. After math, they also aim to teach computer skills as well as life skills and drama. By learning English, the children gain confidence to go out in the world, especially because many employers look for proficiency in English. Most of the women volunteers are all professionals or educated people who choose to stay at home (after quitting their high paying jobs) in order to take care of their families, and they bring a different set of values and inspire a thirst for knowledge in the children. They also form bonds with the students, which is clear from the excitement on the children’s faces when a volunteer returns. Volunteers, in turn, feel a sense of empowerment and fulfilment, while making connections. The plug-in plug-out system works beautifully for both ladies who have limited time to spare as well as the employees who have to do a certain amount of social work as per the company requirements. The idea started off in March of 2013, and the pilot program began in June. As the program proceeded, the material was tweaked and improved. 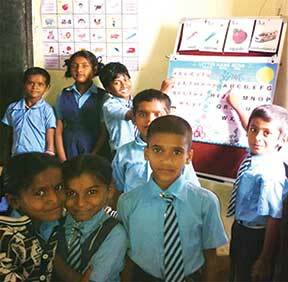 They started by teaching at three schools with around 30 volunteers helping 180 students. Now, they have about 100 volunteers for 500 students in 10 schools across Bangalore with hopes that the program will continue to grow steadily. Step Up For India plans to reach out to many more schools by partnering with large corporates and volunteer organizations. They also hope to recruit young, enthusiastic college students as volunteers. Step Up for India is trying to spread the joy of learning to underprivileged students in one of the most effective ways in recent times. I truly hope that many will get behind it to make India‘s youth ready to face the challenges and step up to a brighter future. Please check out Step up for India facebook page at https://www.facebook.com/stepupforindia and website at www.stepupforindia.org. Please contact the founders to start this program in your neighbourhood schools: Nandita Aras, Shanthi Nair and Sangna Lakshmi at info@stepupforindia.org. The author is a B.Math (Hons) second year student at Indian Statistical Institute, Bangalore. She is passionate about reading, playing violin and listening to music. She can be reached at raginirama@yahoo.com.